Hi, as the title says, I am looking for an association. I usually have my bonus on 32+ and check in daily. So far I've never missed a promotion, nor the champions league. I don't care too much about the level of the association, as long as players are active and give their best to win. Edit: Preferably English speaking, but I speak, German and French as well. 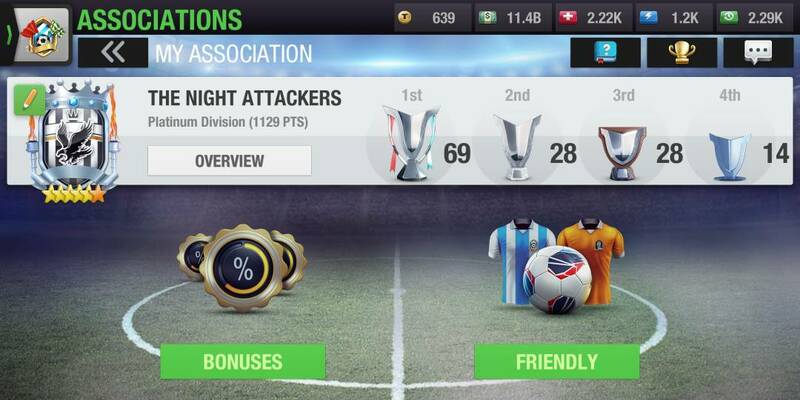 if you are interested to join we are silver 2 association (we have already 130 points more than we need for for silver 1. We are ranked for one more time in the first place of top 100 at our category. Every month we have promotion at third week, so at fourth we just gather points for next promotion. Gold Div 1 Association, on course to promotion to Platinum after today looking for a new member as most recent member has become inactive. The inactive member will be kicked following today’s final so requests will be considered following this! All other players are very active and 3 are original members, from the very beginning of Association mode. Current members are all 6 star plus and all but one at manger level 60 plus, so we are long term players and are looking for similar. English speaking but definitely International in approach. Hi! I have seen that you don't have any more place in your association, but I'm looking for an active association, I have lvl 29, 93% and still developing 😊 is it possible to join you? Request to join "The Night Attackers"